The findings have possible implications for the progression to Alzheimer’s disease. An existing anti-seizure drug improves memory and brain function in adults with a form of cognitive impairment that often leads to full-blown Alzheimer’s disease, a Johns Hopkins University study has found. The findings raise the possibility that doctors will someday be able to use the drug, levetiracetam, already approved for use in epilepsy patients, to slow the abnormal loss of brain function in some aging patients before their condition becomes Alzheimer’s. The researchers emphasize, however, that more studies are necessary before any such recommendation can be made to doctors and patients. The new study, presented July 20 at the International Congress on Alzheimer’s Disease in Paris, also shows that excess brain activity in patients with a condition known as amnestic mild cognitive impairment, or aMCI, contributes to brain dysfunction that underlies memory loss. Previously, it had been thought that this hyperactivity was the brain’s attempt to “make up” for weakness in its ability to form new memories. The clinical study, funded by the National Institutes of Health, tested 34 participants, some of whom were healthy older adults and others who had aMCI, meaning that they had memory difficulties greater than would be expected at their age. Each person participated in a sequence of two treatment phases lasting two weeks each. Patients received a low dose of levetiracetam during one phase and a placebo during the other. After each treatment phase, the researchers evaluated subjects’ memory and conducted functional magnetic resonance imaging of their brains. These scans were used to map brain activity during performance of a memory task, allowing the researchers to compare each individual’s status both on and off the drug. Compared to the normal participants, subjects with amnestic MCI who took the placebo had excess activity in the hippocampus, a part of the brain essential for memory. But when they had been taking levetiracetam for two weeks, the excess activity was reduced to the same level as that of the control subjects; memory performance in the task they performed also was improved to the level of the controls’. The findings have possible implications for the progression to Alzheimer’s disease. Studies showing excess activity in the hippocampus in patients with aMCI have found that if these patients are followed for a number of years, those with the greatest excess activation have the greatest further drop in memory and are more likely to receive a diagnosis of Alzheimer’s over the next four to six years. Other recent research provides a clue as to why this might be the case, says Gallagher, the Krieger-Eisenhower Professor of Psychological and Brain Sciences in Johns Hopkins’ Krieger School of Arts and Sciences. Between 8 and 15 percent of patients with aMCI progress to an Alzheimer’s diagnosis every year, making aMCI a stage of transition between normal aging and neurodegenerative disease. At present there is no effective treatment to modify this progression before irreversible damage has occurred in the brain. It would be a significant breakthrough to slow the progression of Alzheimer’s, a disease that is expected to affect as many as 16 million Americans by 2050. Levetiracetam, the drug used in the study, is an anticonvulsant that decreases abnormally high activity in the brain. It is combined with other drugs to treat certain types of epileptic seizures. 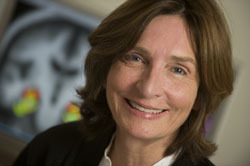 The team that conducted the Johns Hopkins study included Marilyn Albert and Gregory Krauss, both professors of neurology at the Johns Hopkins University School of Medicine, and Arnold Bakker, a graduate student in Gallagher’s laboratory, who presented the findings at the Alzheimer’s conference. Gallagher is the founder of, and a member of the scientific board of, AgeneBio, a biotechnology company focused on developing treatments for diseases that have an impact on memory, such as amnestic mild cognitive impairment and Alzheimer’s disease. The company is headquartered in Indianapolis.